Yesterday I finally took the bus with the kid. 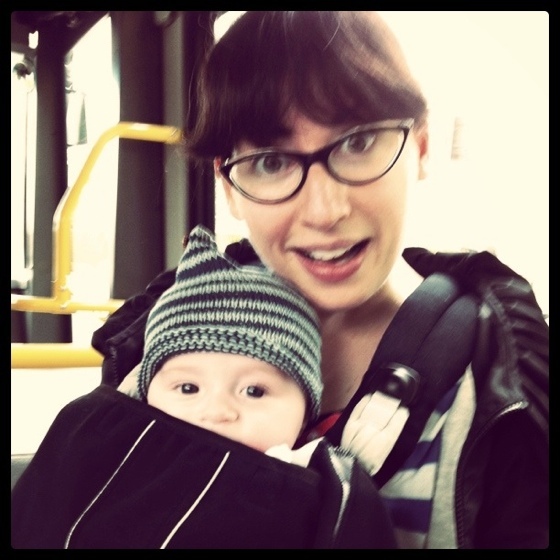 I avoided confronting my stroller-on-the-bus anxiety by just wearing him in the carrier — which, really, is easier anyway. When we got on the bus the driver smiled at Owen and I mentioned it was his first bus ride. This seemed to please her greatly. She asked if we were going to document it with a picture. So Greg took my phone and took one. I love chatting with the strangers I encounter in the ordinary goings-about of my day. You never know how much enjoyment they might imbue upon the mundane. But not if you don’t speak up. And thinking bigger, you rarely get what you don’t ask or strive for. I’ve been chewing on that a lot as I get back to looking for projects to work on. I’ve been in my very secluded family bubble for a few months, and am keenly aware of how much I don’t know about what’s going on in my beloved world of creativity and crafts. So my first step in getting back to work is simply to tell all of you that I’m back. Because if I don’t do that, how could I hope to connect with possible co-conspirators, colleagues and contracts? I couldn’t. That is sooooo cute! I remember doing something similar. I had a regular driver that I had when I was pregnant so we talked a lot. I didn’t take pics though. It was before the internet. He remembered me as I was the one dialing with morning/motion sickness. One time I managed to get off the bus before getting really sick. Not only did he hold my hair he got me ginger ale and crackers. Now that is going over and above the call of duty! It was on the Fraser bus. That’s amazing! I think bus drivers are the unsung heroes of daily life. When we got on the bus the driver smiled at Owen and I mentioned it was his first bus ride. 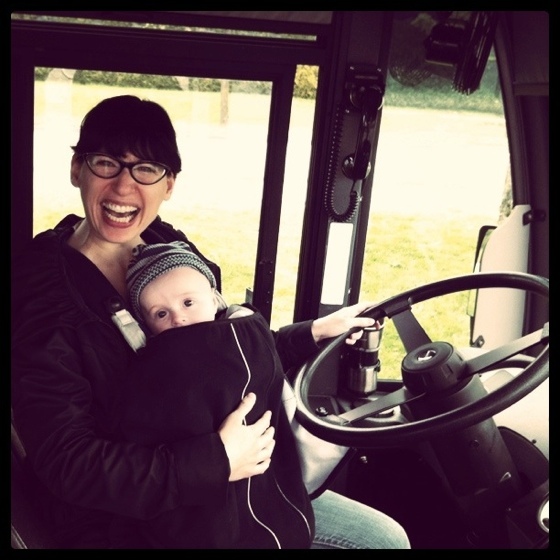 The photo of you and Owen is hilarious, you’d make a great buss driver mom! :-) News from me is that this winter I read the triologi about the Hunger games thanks to you! Loved it, so big huge thank you for that book blog post. I also borrowed Proloux book at the library but couldn’t finish it, maybe not as poetic in Swedish translation or maybe it wasn’t for me. Still, I gave it a try. One of my favourite things about life! Talking randomly to people can procure the most wonderful encounters. Such a lovely post. as the kids these days say: OMG so cute! Really though, those are adorable pics. Congrats again to you both on The Kid.